Mrs. BDB and I were out for a pub crawl last Friday nite, and began our journey at a bar in the NW. We thought we’d better eat first, and by chance wandered into Henry’s Tavern, at Burnside and 12th. Henry’s is part of RUI, the Seattle restaurant corporation, the same folks who brought you Kincaids, Palomino, Newport, Stanfords, etc., etc, ad nauseum. Cookie cutter casual dining for a cookie cutter society. The place is nicely decorated, and we were greeted and seated promptly. Our perfunctory waiter (I use that word a lot in these posts), did his absolute worst to make us feel unwelcome and uninformed. We were not told if there were any specials, nor were we told there was a happy hour menu available. He asked us for our drink order, asked us if we wanted to start with appetizers, (“no”) and vanished to fetch our drinks. As we looked around the restaurant, observed and listened to the servers, it seemed they were all exhibiting similar “attitudes.” Very much reminded me of the restaurant we went to on 23rd where Mrs. BDB thought it seemed like the entire staff’s cats or aunts died that day. No matter how bad a company is, a good GM can fix a restaurant like this, making sure the attitude of hospitality workers is “hospitable.” Folks, if you don’t want the job, don’t want to do your best, quit. Mrs.BDB had her second burger of the year, the diminutive version of the Sharp Cheddar Burger, which is 8 oz of Painted Hills Natural beef, Tree Hugger Porter mustard, Sharp Tillamook® Cheddar, garlic mayo, ripe tomato, onion, green leaf, on a brioche bun. Add bacon for a buck. The lesser version, “Kristine’s Burger,” shaves a couple of ounces of beef off for a buck less. The patty was cooked to Mrs. BDB’s specifications, and since I didn’t feel like a burger that night (WTF? ), she offered me a taste of hers. You’ll get no argument from me that Painted Hills beef is flavorful, but whatever flavor is inherent to the beef is muffled by the melange of condiments Henry’s piles on, including the menu mentioned garlic mayo and beer mustard. The complexity of the garlic was offset by the beer ’stard, and both were canceled out by the (not mentioned on the menu) bread and butter pickle chips, and the side ramekin of garden variety ketchup. The extra cost bacon was very good. It always amazes me (Ok, not really) that restaurants can go to such meticulous care with some ingredients in a dish and blow off others. The fresh cut fries were limp, not surprising, we had a clear view of the kitchen, and frequently orders were destined to heat lamp hell for far too long. No real clue as to why these dishes weren’t delivered as they came off the line. But we are here for pizza, so let's focus on that. 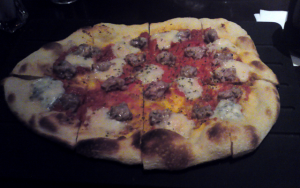 I ordered a ‘fennel sausage and Gorgonzola” flatbread (that’s the new word for pizza, it seems), which came on a serving board, sliced in squares, about 10″ x8″, ample enough portion for me, the sausage was hand-pulled and flavorful, the Gorgonzola was placed in blobs around the pizza, as to cover it all with that strong a cheese, many people would not find appealing (but try me!). The crust was flaky and chewy in the right parts, with a smattering of nice oven char. Things the way they are, I thought the meal was a fairly good value, about $10 a head, not including drinks. We’d probably go back. For a Friday nite, 6 ish, they weren’t all that busy, and clientel was diverse, from the yuppie generation to middle aged farts like me, and a gaggle of blue hairs. Before we do go back, however, I’d just as soon the staff get a little pep talk, or purchase new attitudes, and also advise us of our dining options, highlight the menu offerings, small stuff like that. I tipped generously despite the blase service. Silly me.